Update 6 June 09; this restaurant had been replaced by Shanghai JJ Restaurant. 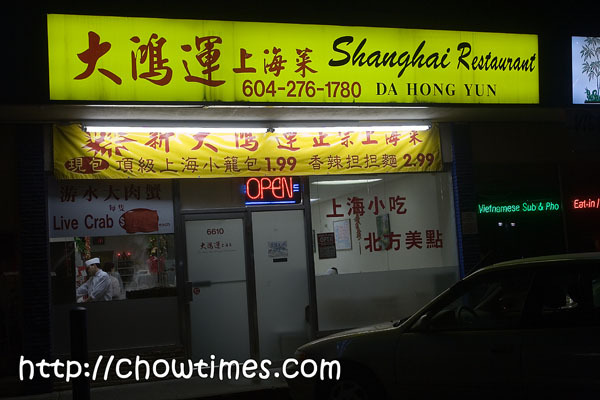 Have any of you ever been to this Shanghainese restaurant right across No 3 Road from the Richmond Centre Mall? For some reason, they had been changing hands several times over the years. I am not sure why because they seem to do very well as evidenced by how packed it is all the time. It is now called Da Hong Yun but I remember they used to be called Shanghai Wind and at another time it was called Chen’s. We went there because we were enticed by the Live Crab banner that they put up outside. The restaurant is smallish with something like 10 tables at the max. It’s so cramped that it was hard to move around once all the tables were filled. Decor wise, there is nothing much to it (why they even have Chinese New Year decorations still hanging in the store even today). 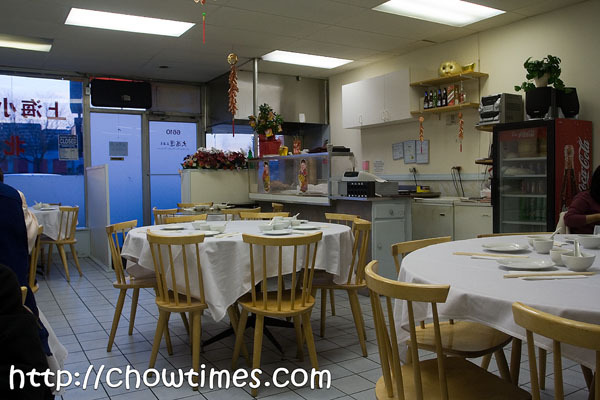 This is a very traditional Chinese restaurant which means that they cater to mainly Chinese customers. It’s because there is only one waitress who could barely managed to communicate in English. So ordering here was quite difficult for us. Despite the language difficulty, we managed quite well ordering the Duck with Fried Gluten. 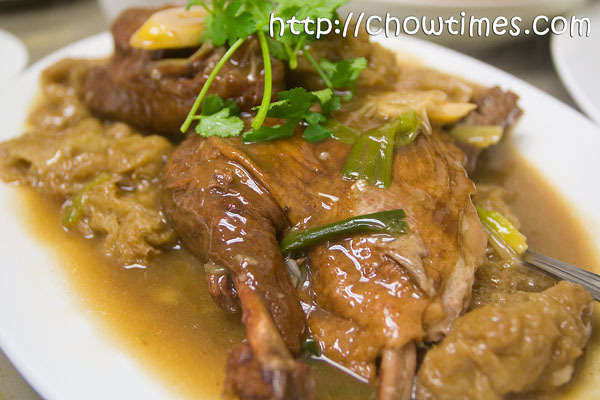 The duck was extremely tender and meaty, much to our surprise. For $12.95, it was a half duck dish. What we liked best was the tasty sauce and bamboo shoots. For the vege, we ordered the Tou Meow Seong Tong (sprouts in soup) which was quite crunchy and the steamy soup was great for a cold night. However, it was quite expensive. I am not sure why such a dish would have costs $12.95. We ordered crab and decided order what they call Kam Sar Gook which is literally translated as Golden-Sand Steamed. 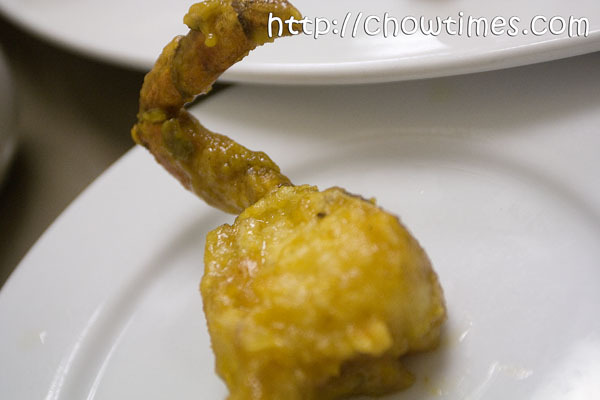 It is actually cooked with salted egg yolk and was very crispy … so crispy that we do not need to use a cracker to break the shell. However, there were not much meat at all in the crab. If I recall correctly, they charged $10.99 for a crab regardless how you want it cooked. Despite ordering only three dishes, it was too much food for the four of us in the family. The total damage was $47 including tax and tips. I felt it was too expensive for a smallish place like this. Good food but quite pricey. 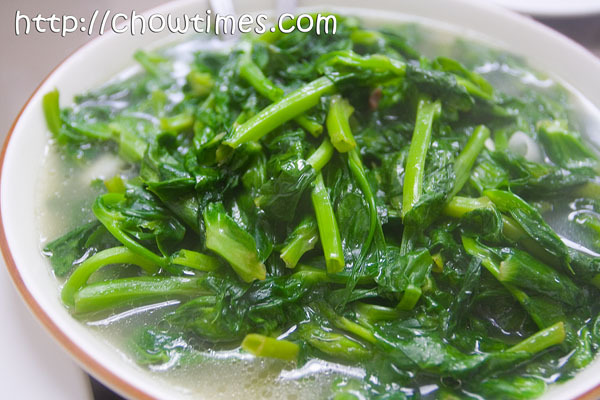 Diao Miu (the Teo Meow Song Tong you ordered)is an expensive delicacy because they are the bean shoots that are picked when they are budding and at its most tender; left to grow longer, the stems are quite tough to eat. The plant isnt left to grow and the total quantity harvested is very little. When fingerfoods (crabs, lobsters) are ordered, typically on special meals out or at banquets, sometimes my parents would pour hot tea into clean rice bowls and use them to clean fingers with, instead of the “lemon soup”. They say tea is very effective in “huay yau” (ridding the grease). Actually, when I was an FOB in Canada, my wife and I got invited to this fancy Chinese banquet. They served lobster and with that bowl on the side. I actually dipped my piece of lobster in the bowl thinking it was a sauce. My brother in law looked at me with horror in his eyes. Well, you can’t blame me. I don’t think we have finger bowls back in the Phils. Our Queen of the Netherlands had a royal guest for dinner once. They also had a bowl of lime water to wash their hands with. The guest who was not familiar with this custom, took a sip from this bowl. To spare him from embarresement, our Queen followed him by also drinking from the lemon water. I agree w/winz, the greens in the pic are usually $3.99 to $5.99/lb at T&T. BTW, was a bit disappointed w/the noodle house you blogged few posts down, the bowl was big but the quantity was not, and yes even w/ 25% for me was spicy enough.Usually i only ordered the regular at Thai Son and it fills me up. hi just browsing, love food blogs!! I live in Richmond, and usually Da Hung Yun have some pretty ok things price-wise, although it is quite crowded and def not 5 star in terms of decor… i go every once in a while. the noodles and the little shanghai pork bun things are my favourite. anyway i agree it was probably a little on the steeper side but at least it didn’t taste bad ^^. 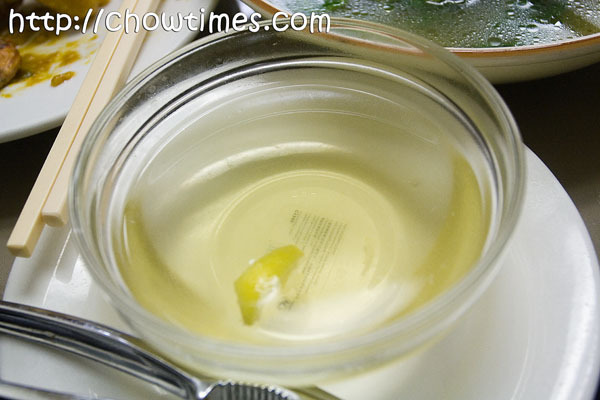 This is what I am thinking about the bowl of water with the lemon in it. . .
Usually when we order a dish where we use our hands to eat the food, and it makes our hands greasy, we use that bowl of water to clean our hands at the table if they provide it for us. Sometimes instead of lemon and water, a restaurant may give us lemon and tea in a bowl. I’m not quite sure if the one they gave you was for that, though. Not to judge without first-hand experience, but sounds like from your description that a relatively simple, 3-dish meal like this is overpriced ($47 !). 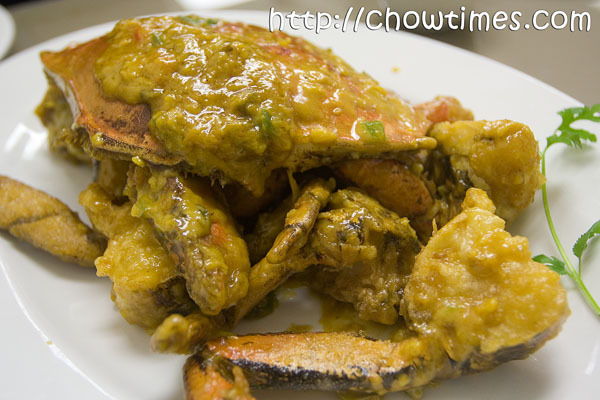 Seems to me the crab special is exaggerated (size-wise) despite its $11 flat price. And the sprouts dish seems quite overpriced IMHO, and this is where they made up the margin from the crabs. I recall some really good valued set meals at Happy Date Restaurant, I believe they’re still there on Park between #3 Rd and Garden City.